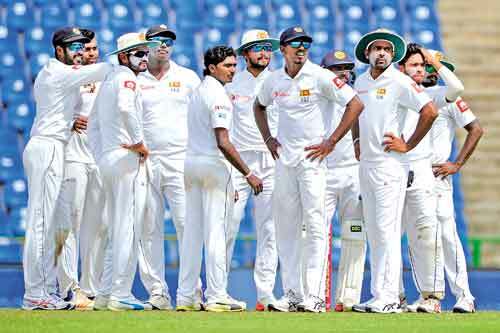 Given the strength of their formidable opposition and the fragility of the tourists, one may argue that Sri Lanka are walking into the lion’s den when the tour of India kicks off next week. But Test skipper Dinesh Chandimal says his charges are brimming with confidence following their recent 2-0 win against Pakistan to take on the mighty Indians. The first Test will begin on November 16 in Calcutta, followed by the second Test in Nagpur (Nov. 24-28) and third in Delhi from December 2-6. Sri Lanka have endured difficult times in recent months, losing almost everything across all formats but a 2-0 surprise win against Pakistan last month has given some confidence to a young team who is desperate to turn the tide. In seven previous series on Indian soil, Sri Lanka have conceded defeats in 11 matches with the remaining six ending in draws. Their best performances to date remain in the 1997/98 series where the three-match tour ended in a nil-all draw. Sri Lanka last played a Test series there in the 2009/2010 season where India comprehensively beat a star-studded side 2-0 after Kumar Sangakkara’s men managed to draw the first match in Ahmedabad hammering a mammoth 760 for 7 declared on the back of Mahela Jayewardene’s 275. “Playing India in their own backyard has not been easy and we are well aware of the challenge before us,” he continued. However, Chandimal is among several other players who are visiting India for the first time for a Test series. Only former skipper Angelo Mathews and Rangana Herath have played a Test in India. Herath was Sri Lanka’s top wicket-taker during the series in 2009, ahead of Muttiah Muralitharan, while Mathews missed his maiden ton, having got out for 99 in the third Test. “I will depend a lot on these two players, especially Mathews who is one of the best players in world cricket today. Their experience playing in Indian conditions will boost the team’s performance during the series,” Chandimal said, optimistically. While Chandimal refused to comment on the final squad, which is yet to be released, he hinted at some changes to the top order composition. With reports suggesting the axing of misfiring batting duo Kusal Mendis and Kaushal Silva from the squad after poor form in UAE, Sri Lanka may look to Dhananjaya de Silva to open the batting with Dimuth Karunaratne. In Test cricket, the opening pair is one of the keys and their success is really important for a team to make an impact. Dhananjaya has opened batting at domestic level and he is in contention for an opening slot with Sadeera Samarawickrema who batted at number 3 in his maiden Test in Dubai. Mendis, one of Sri Lanka’s brighter prospects, with three centuries and four half-centuries under his belt in as many as 22 matches, was a pale shadow of himself during the recent Pakistan series, scoring just 58 runs in four innings—a major contribution towards his axing from the side. Kaushal, who is Karunaratne’s opening partner, has for a while struggled for runs at the top of the order and his axing was no surprise. But Mendis’s exclusion has surprised former Sri Lanka skipper Mahela Jayawardene who questioned the wisdom of the selectors. “Don’t understand how Kusal Mendis is not in the squad to India? Even if he is not playing, he should be in India. That’s how young players learn,” Mahela tweeted. Against India at home, Mendis smashed a century (110) in the second Test. The selectors have also retained Lakshan Sandakan in the side ahead of Malinda Pushpakumara—the left arm spinner who is in great form. Pushpakumara, who made his debut against India in August, had picked up 23 wickets in six innings as Sri Lanka A put up a spirited effort to record a 2-1 win in the unofficial Test series. With all-rounder Asela Gunaratne yet to regain complete match fitness after a long injury-lay-off, the selectors have recalled Dasun Shanaka into the side. Shanaka scored an unbeaten 102 and 60 in the second unofficial Test match against West Indies A. The Test tour will be succeeded by three ODIs and three T20 Internationals. Probable Sri Lanka squad: Dinesh Chandimal (Captain), Lahiru Thirimanna (Vice Captain), Dimuth Karunaratne, Dhananjaya de Silva, Sadeera Samarawickrema, Angelo Mathews, Roshen Silva, Niroshan Dickwella, Rangana Herath, Lakshan Sandakan, Dilruwan Perera, Suranga Lakmal, Nuwan Pradeep, Vishwa Fernando, Lahiru Gamage and Dasun Shanaka.